You can get the selected date from calendar control. There is a "SelectedDate" property of calendar control. This property is get and set property so you can also set date of calendar control. 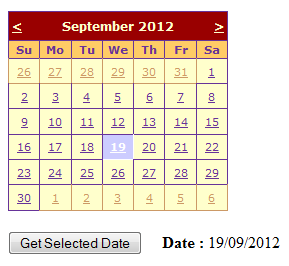 Calender control provided in asp.net. In this example we take calendar control , button and label. First you select date in control. By Default today date is highlighted but not selected. When you select date at that time date background color will changed after that On click of button we retrieve selected date from calendar control and display in label. We can also format the date and display in our specific date format. in this example we display date in "dd/MM/yyyy" format. <asp:Button runat="server" ID="btnGetSelectedDate" Text="Get Selected Date"
This type of .Net Tips is very useful in day to day programming life. Note : Give Us your valuable feedback in comments. Give your suggestions in this article so we can update our articles accordingly that. Get Email of New Posted Articles. Enter Your Email Address in Below box.